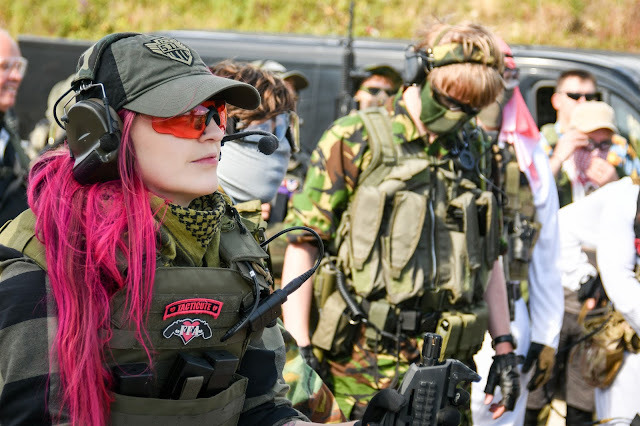 I get a lot of my friends (female and male) ask me what exactly airsoft is, so I'm going to give you a quick insight to what we do. Airsoft is a sport where players 'eliminate' each other by shooting plastic ball bearings from replica firearms. The sport originated in Japan in the late 70's, and it soon caught on in the UK in the 80's. It is now a global hobby﻿ enjoyed by people of all ages. Firstly, as long as you wear ample protection, it is safe. To protect myself I wear under armour, combat trousers, a smock and a chest rig on my body to deflect as much as the BBs power as possible. I also wear walking boots to protect my ankles and feet during a game - especially if you're playing outdoors! It's really important to have a good pair of boots just in case you fall or catch your ankle in a tree root or rabbit warren. My face is the most protected part of my body - after all eyes can't be replaced! I wear goggles, a mesh half face protector, a hat to protect the back of my head and a shemagh to protect my neck. Wearing this protection, I have never had an injury. 'Does it hurt?' - I personally think it depends on where the BB hits you and how close you were to the weapon to whether it hurts. With my protective gear, getting hit in the chest, back and face do not hurt at all. However where there is less protection, such as inner thighs, shoulders and hands, it can sting quite a bit. However, this has not deterred me from playing a game. 'Why would you want to do that?' - It's fun, it brings people together, it keeps me fit and active, I've made great friends doing it. The reasons are endless! I know getting shot at by BBs doesn't sound like a whole lot of fun but with great sportsmanship and good spirit, it is a really enjoyable sport that can be played by anyone!